In this week's episode, The Cell Games have begun and the Z-Fighters have gathered to save the world and defeat Cell, the perfect warrior. Teaming up to take him down. Goku, Gohan, Vegeta, Krillin, Trunks, and Piccolo must work together in order to stop Cell from destroying the planet Earth. In Dragon Ball Z: Perfect Cell. 2 to 4 players will each control an iconic Dragon Ball Z fighter, roll their dice to generate energy, and use attacks and strategy to defeat Cell. Using battle hardened strategy, player allocate their dice for attacks, giving energy to other players, or buying upgrades and learning new abilities. Players need to work as a team, as Cell will continue to generate new threats that attack the Z-Fighters, heal himself from damage, or lock players out of potentially game-changing upgades. Will the Z-Fighters save the world from their deadliest foe yet? 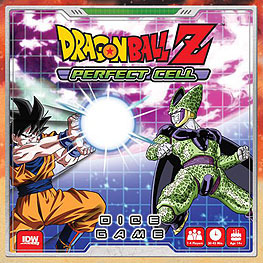 Find out in Dragon Ball Z: The Perfect Cell, a Team Takedown Dice Game!